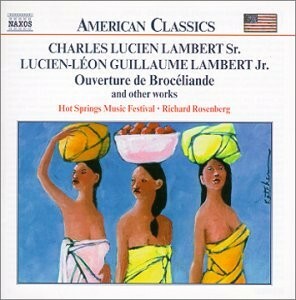 Home -> Composers -> Lambert, Lucien-Leon Guillaume, Jr.
Prelude, Fugue et Postlude (6:34) et al. The young Lambert's Promethee enchaine won the Concours Rossini in 1885. Some time in the mid-1870s, he was decorated by the King, Dom Pedro, for a new piano method. He later taught in Paris, where the Bibliotheque Nationale in Paris now holds thirty-two of his pieces dating from 1866 to 1899. This information is found in a work by James Methuen-Campbell, Catalogue of Recordings by Classical Pianists, Volume 1, published by Chipping Norton, Oxfordshire, 1984.